Toshiba Corporation, earlier named Tokyo Shibaura Electric K.K. (after the Shibaura district in Tokyo), is a Japanese multinational electronics, electrical equipment and information technology corporation headquartered in Tokyo, Japan. It is a diversified manufacturer and marketer of electrical products, spanning information & communications equipment and systems, Internet-based solutions and services, electronic components and materials, power systems, industrial and social infrastructure systems, and household appliances. In 2010, Toshiba was the world’s fifth-largest personal computer vendor measured by revenues (after Hewlett-Packard, Dell, Acer and Lenovo). In the same year, it was also the world’s fourth-largest manufacturer of semiconductors by revenues (after Intel Corporation, Samsung Electronics and Texas Instruments). 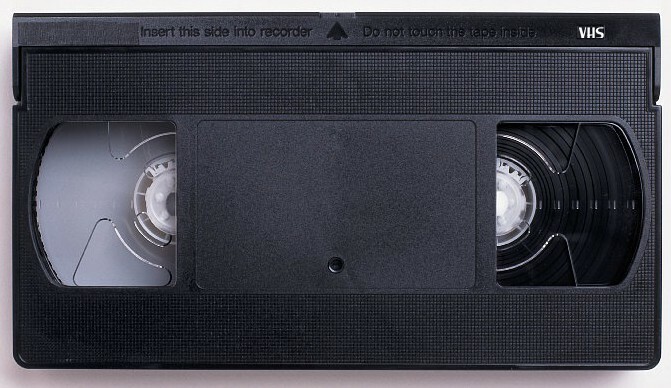 The Video Home System (better known by its abbreviation VHS) is a consumer-level analog recording videotape-based cassette standard developed by Victor Company of Japan (JVC). The 1970s was a period when video recording became a major contributor to the television industry. Like many other technological innovations, each of several companies made an attempt to produce a television recording standard that the majority of the world would embrace. At the peak of it all, the home video industry was caught up in a series of videotape format wars. Two of the formats, VHS and Betamax, received the most media exposure. VHS would eventually win the war of, and therefore succeed as the dominant home video format, lasting throughout the tape format period. 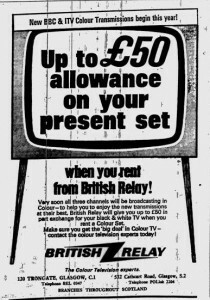 Advert from 1977 for the British TV rental company ‘British Relay’. 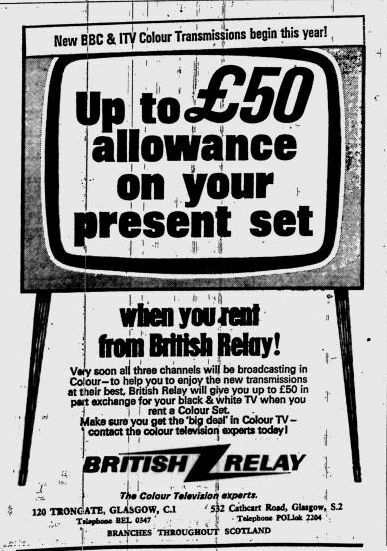 This advert on the right is originally from the Glasgow Herald (November 1969) promotes British Relay (prominant in many Ayrshire towns) as a source of rented TV. The first regular colour broadcasts in Europe began on BBC2 1st July 1967 followed by BBC1 and ITV in 1969. As well as renting televisions, British Relay provided a cable service of TV and radio signals. Eastman Kodak Company, commonly known as Kodak, is an American multinational imaging and photographic equipment, materials and services company headquartered in Rochester, New York, United States and incorporated in New Jersey. It was founded by George Eastman in 1889. Kodak is best known for photographic film products. During most of the 20th century Kodak held a dominant position in photographic film, and in 1976 had a 90% market share of photographic film sales in the United States. The company’s ubiquity was such that its tagline “Kodak moment” entered common lexicon as a personal event that demanded to be recorded for posterity.